LankaWeb – If India is sold Mattala-Galle-Palali-Trinco & Colombo will Sri Lanka be sovereign? If India is sold Mattala-Galle-Palali-Trinco & Colombo will Sri Lanka be sovereign? India cannot easily control Sri Lanka militarily, so the next best option is to control it economically & socially. In June 2012 Sri Lanka’s government rejected India’s offer to develop Palali airport which the Sri Lankan government said would be run jointly by the Ministry of Civil Aviation & the Air Force. In 2017 the PM declared that Palali will be developed as a ‘regional airport’ to serve Sri Lanka & South India. In other words Palali goes to India. The PM’s financial advisor behind the deal! Mattala Airport was built by the Chinese to complement the Hambantota Port & Industrial Zone. It was meant for investors to fly direct to Mattala make approvals at either the industrial zone or Port & fly back. It makes no sense for foreign investors to land in Colombo & travel all the way to Hambantota for approvals. The present Government laughed at the Airport claiming it to be good only to store paddy and now India is supposed to be wanting to buy an empty airport & Sri Lanka is willing to sell an airport for a supposed flying school which in reality it looks to be an attempt to position India’s Air Defence in Mattala thereby diminishing the Hambantota Port for China’s OBOR initiative. Apparently India wishes to have provision to re-lease or sublease the Airport to whom it so likes which again raises alarm bells for the sovereignty of Sri Lanka. Why should India get an Airport for 40 years to turn into a military base? Mattala would become the first airport India will have on foreign soil. In 2002 PM Wickremasinghe proposed a ‘Hanuman Bridge’ across the Palk Strait. India even requested Asian Development Bank to carry out a pre-feasibility study to finance the road-rail link between India’s Rameswaram & Sri Lanka’s Thalaimannar. & the bridge across the Palk strait between India & Sri Lanka. The distance between India’s Dhanushkodi in Rameswaran & Sri Lanka is 23km. India wants to make a flyover connecting the two. Developing Kankasanthurai – In 2017 PM Wickremasinghe declared that India would develop Kankasanthurai harbor. In 2018 a MOU was signed with the Exim Bank of India to develop Kankasanthurai to a commercial port & upgrade the Kankasanthurai harbor. Galle Port – Rumour also has it that part of the Mattala Airport deal includes the handing over of Galle Port to India by removing the entire Naval deployment & transferring them to Hambantota Port. This would immediately negate Sri Lanka’s capacity to protect its territory. Colombo East Terminal – the 5th latest container terminal & will become the biggest in Colombo’s Port. This terminal is also going to an Indian company. More than 60% of Colombo transship comes from India. This is likely to affect employment of Sri Lankan labor & arrival of shipping lines too. Note how quick India was to propose a 500-MW thermal coal power plant ($500m) in Trincomalee district immediately after the Sri Lanka Army captured Sampur from LTTE which would give India 500 acres in Sampur. 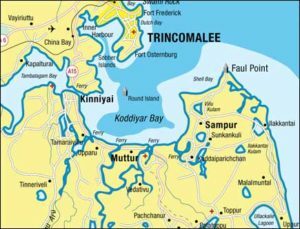 Objections were made to the former government against the project in view of the real objective behind the project being to secure access to Foul Point to overlook the Trincomalee harbor. The MOU is to make joint investments in the development of the Trinco Port, Petroleum Refinery & other industries in Trincomalee. Under CEPA (Comprehensive Economic Partnership Agreement) India can bring down technical staff from 10% of total staff cadre up to 50%. According to CEPA there will be 50% Indian ownership of 25 cinemas, each of which could hold multiple cinema halls. In these cinemas, 40% cinema time would be for Tamil and Hindi films. The proposed Indo-Lanka economic & technology cooperative agreement ECTA was drafted in great secrecy & agreement not disclosed to the public. It makes Sri Lanka further vulnerable to a country. Of the trade agreements with India since 1988 none have been beneficial to Sri Lanka while Sri Lanka has become a dumping yard for cheap Indian imports. Oft times the federal regulations impede Sri Lankan businesses trying to get a foothold into Indian market. Raising alarm bells is the inclusion of service industries & manpower which means an unhindered entry of Indians to start businesses, employ Indians, work & live in Sri Lanka which will pose challenges to Sri Lanka’s own unemployed as well as raise issues regarding environment, accommodation, food & energy requirements etc. Already unregistered number of Indians are working illegally & legally in all provinces of Sri Lanka. Bilateral trade between India & Sri Lanka was $4.6billion in 2014 of which Sri Lanka’s share was a mere $600m. 40% of goods in Jaffna are from India. 31million Indians are unemployed. There are a million unregistered and unqualified medical practitioners in India what if they all end up working as ‘doctors’ in Sri Lanka? Immediately after elections 800 maruti cars were imported giving a substantial slash in import duty while increasing import duty for hybrid vehicles. Many said it was a thank you for helping win the election! Even India’s gift of ambulances is doubted by the citizens. Former Additional Secretary to the Indian cabinet B.Raman now heading a think tank proposed India use tourism to counter China’s presence in Sri Lanka while the BJP espouses to elevate the ethnic to a religious issue bringing the Hindu element & the promotion of the Ramayana Trail has to be looked from these two Indian objectives. Is the Ramayana Trail being linked to the greater Eelam project that espouses to annex Sri Lanka to India? The Eelamists claim Ravana was a Tamil King, who worshipped Shiva in Trincomalee & Mantota & both cities are Isvaram” cities implying Tamil ownership not Sinhalese. These are all mental build ups at tourism levels for diplomatic objectives. Apart from the Indian High Commission in Colombo, India also has presence in Jaffna, Kandy & in Hambantota too. In 2017 news emerged of the Jaffna Indian consulate providing forged documents to South India Tamils to migrate to northern Sri Lanka. In 2011, the Indian Counsel General in Jaffna V. Mahalingam had interfered in the judicial process following the seizure of 112 Indian fishermen along with 18 trawlers in the general area north of Point Pedro. In 2015, Sri Lanka expelled the Colombo station chief of India’s spy agency accusing him of conspiring to overthrow the Rajapakse government. Sri Lankan military personnel received training in two Dornier aircraft, belonging to the Indian Navy in June 2017. Air-Road-Rail-Sea link between India & Sri Lanka is fast turning into a reality with decision makers arguing in favor looking only at the supposed economic dividends completely ignoring the political & social realities. Illegal immigrants from India, LTTE terrorists using South India as a logistics hub inspite of assurances by the Indian Government, illegal inflow of narcotics & other banned substances from India are just a handful of dangerous implications that have been ignored. It has become fashionable for India to use the slogan of ‘threat to Indian security interests’ and bulldoze India’s demands for which Sri Lanka has had to follow the policy of appeasement to the extent that officials are probably remaining mum as every MOU is being signed & drafted according to India’s wishes. One has to wonder if the deal to give Hambantota to China was simply an eye-wash to fool the Chinese & thereafter handover everything to India as we now see happening. 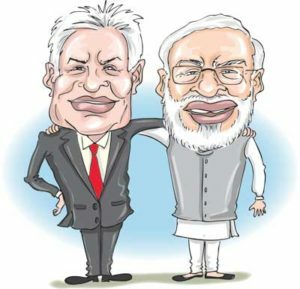 Behind all these deals are a handful of evil & terrorist-associated elements who are peddling the neo-liberal policies that are earmarked to turn Sri Lanka into an Indian colony & a vassal state. Where will all these politicians & the bureaucrats that surround them go after selling our country as not a penny out of these sales have they given to the nation or its people from these treacherous sales except to always blame previous governments claiming the sale is to set off debt by them. None of the debt has reduced except doubled every time a new government has come to power. 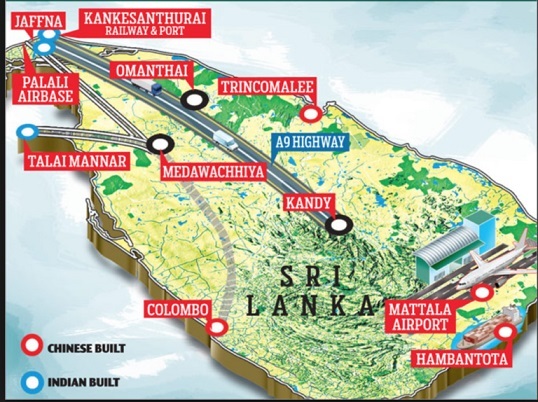 However, the manner this government has handed over to India the North (Palali), East (Trinco), South (Mattala, Galle), West (Colombo East Terminal) is unforgiveable. To add to injury this government wants to build a Hanuman Bridge (connecting India by road/rail/bridge) while signing trade agreements that enable Indians to come & work & live in Sri Lanka & over time with marriage what will be the outcome for Sri Lanka? Are policy makers asleep to these dangers? Sri Lanka has lost its sovereignty completely. Can they salvage the situation by reversing these deals is what citizens must now demand of them? It is time the people stood up against these treacherous sale of Sri Lanka’s resources/assets. Thanks Shenali. We are an Indian colony like Mauritius. What is most appalling is the lackadaisical attitude of the Joint Opposition in the face of these Extra Constitutional actions of the Ranil – Sirisena traitorous administration. There is hardly a protest by them against these acts that compromise the independence, security and territorial integrity of our Motherland. They seem to take a “what can we do” attitude. I believe as a sizeable majority in the Parliament they have a right to inform these foreign powers that any agreements they sign with the current administration is ultra vires and not supported by the vast majority of the Sinhalese – the majority community of Sri Lanka. The defeastist attitude they are taking is not worthy of a responsible opposition. Moreover there are other extra parliamentary actions that is there in the repertoire of the political actions. These are issues on which the Opposition can go around the nation but this is not happening giving the impression they too are part and parcel of the sell out! We need more affirmative action on the part of the Joint Opposition apart from making lack lustre and meek statements from far away and rural temples and similar!